CARICOM – Is There Progress? The Summit meeting of the Heads of Government of the Caribbean Community (CARICOM), has just concluded in Montego Bay, Jamaica, and the big question still remains, was real progress made at this meeting? Several of the Governments who are members of CARICOM have been questioning CARICOM’s effectiveness in driving the mission of the Organization. Some of them had a review of their relations with CARICOM and is it productive. The entire Caribbean integration movement has been under scrutiny, and what value exists in the concept and CARICOM’s role in the movement. Frankly, there are but a couple of Government Heads in CARICOM who can truly be described as “regionalist”; as a result most countries of the Caribbean are acting in their own self -interest and regional integration is not a priority. There is a lack of regional interest and questionable effectiveness of CARICOM- serious questions were expected to be raised and addressed at the Summit in Jamaica. 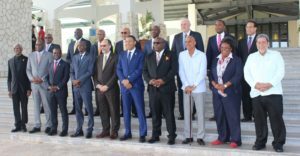 Prime Minister Holness had named a Commission led by former Prime Minister Bruce Golding, to look at the effectiveness of Jamaica’s membership within CARICOM. The report included 33 recommendations addressing the structural and organizational deficiencies within CARICOM. The Caribbean Single Market and Economy, the flagship issue of CARICOM, was put off for a special meeting to be held in Trinidad & Tobago later this year. No real action on CSME, but some talk and the agreement to meet on the matter again. For Jamaica and some other member governments, CSME should be fully operational within the next five years. Prime Minister Holness pointed out that the CARICOM Heads approved an implementation plan in 2007 which mandated an operation within 4 years. Among the key areas on the agenda to be addressed included crime and security strategy, disaster management and climate change, the upcoming G20 Summit in Argentina. Prime Minister Keith Mitchell of Grenada urged his colleagues that CARICOM must reposition itself to operate in a global landscape. Leaders much consolidate their position on key issues to navigate hemispheric and international realities. CARICOM has to come to grasp with its neighbor to the north, the United States and its current leader Donald Trump. The inability to predict his policy on trade and immigration will have to be part of the consideration. CARICOM, once the hope for a strong Caribbean Region, is looked upon more with skepticism than hope. The current leadership is not inspiring, and as a result there is no real excitement with the CARICOM Summit and little is expected to be accomplished. What is hoped for from this Summit is a new seriousness on the part of the governments, and the realization that global environment dictates more regional collaboration. The Golding report, though commissioned by Jamaica, can be useful to the entire region and the CARICOM operation, because of its thoughtful observations and recommendations for the better functioning of CARICOM. There is also some hope from the fact that Mia Mottley, Prime Minister of Barbados, will be leading the CSME effort. A known regionalist, highly intelligent and quite courageous might move this issue. We should be hopeful for CARICOM, but we cannot continue to do the same thing and expect different results. CARICOM has to shape up. Another good sign for CARICOM at the Summit in Jamaica is that Heads of Government from all 15 Member countries were in attendance. That’s a good thing; It is showing some interest and appreciation for the community.